Place beef cubes in 1-gallon resealable food storage plastic bag; add 1/2 cup of the dressing. Seal bag; turn to coat. Refrigerate 1 to 2 hours to marinate. Heat grill. Thread beef onto four 8 to 10-inch metal skewers; discard marinade. When ready to grill, place kabobs on gas grill over medium-high heat or on charcoal grill 4 to 6 inches from medium-high coals. Cook 9 to 11 minutes or until beef is of desired doneness, turning once. Meanwhile, divide lettuce onto individual serving plates. Top each evenly with cucumber, olives, tomatoes and cheese. Drizzle with remaining 1/2 cup salad dressing. Top with cooked beef. To broil kabobs, place on broiler pan; broil 4 to 6 inches from heat using times above as a guide, turning once. Instead of kalamata olives, use your favorite olives from an ethnic market or grocery store olive bar or deli. 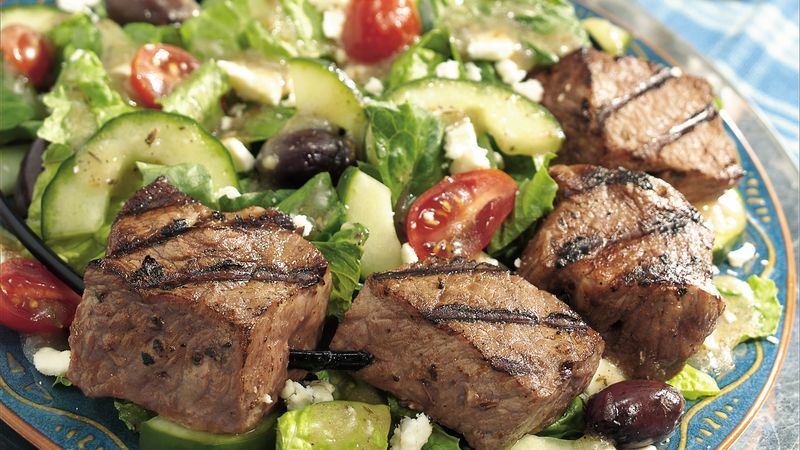 For fun, use curved skewers for this kabob salad. Curved skewers are practical; they stay on the plates without poking out over the rim. To broil kabobs, place on broiler pan; broil 4 to 6 inches from heat using times in recipe as a guide, turning once.